Public employee strikes play a role in American society. Strikes are designed to get visibility, to disrupt “life as usual” in order to draw attention to issues deemed important to workers. In the case of public employees, strikes are disruptive to whole communities who would otherwise be served by the striking employees. A public employee work stoppage is sometimes seen as the final act in creating civic change, when the power structures of government have not provided space for workers' voices to be heard. For teachers in particular, who have entered a profession of service to students, parents, and the larger community within which they are educating young people, the strike may ask them to weigh the immediate needs of current students (a day or week of teaching right now) with the possibility of improved education for those same students in the coming months, and further out, the opportunities for future students. In disrupting the regular routine, a successful strike depends on gaining allies. It depends on parents, students, other workers being willing to support the goals of the strike, and seeing the desired change as one that is important for the community as a whole. The strike in LA came after more than 18 months of failed negotiations. 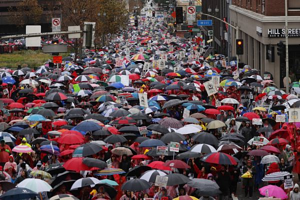 Exploring the LA Teacher Strike can help students to consider public policies and practices embedded in our educational systems, the impact on our students today, and new questions being raised by LA communities. How do communities change? How much power do individuals have to change their communities? What is the meaning of a strike? What is the historical context for striking? How do strikes connect to a “universe of obligation”? What next steps are possible for education in Los Angeles? We encourage you to take an opportunity to remind your students that it is essential that their participation honors the contract they helped create and follows your own classroom rules. Revisiting that contract can be helpful before a discussion that may have strong emotions. How were you and your family affected by the LA teacher strike? What questions did the strike raise for you? What is labor? What is a strike? Divide your classroom in half and ask one half to create a concept map for “labor” and the other for “strike”. A concept map is a visual representation of a topic that students can create using words, phrases, lines, arrows, space on the page, and perhaps color to help organize their ideas and show their understanding of an idea, vocabulary term, or essential question. Students first respond to a topic by brainstorming a list of words, phrases, or ideas they associate with it. Then, they sort and arrange the items in their list visually on a page to represent both the items’ relationships to the topic and to each other. The result is a visual representation of students’ thinking about the idea, term, or question. Memphis Sanitation Workers: What do we learn about labor strikes in the context of United States History? Before focusing on the particularities of the LA teachers’ strike, it can be useful to dive deeper into a historical strike to better understand the way a strike may work, the longer legacies and perspective of a strike, and the precedent for different types of strikes. The Memphis Sanitation Workers strike gained national attention and provides one such example. It should be noted, however, that it is quite different from the LA teachers strike in regard to workers’ reasons, how resolution was achieved, the workers themselves, and other aspects. Some of those differences are addressed below. Learn about the 1968 Memphis sanitation workers’ strike by first hearing the testimonies of two former workers involved in the strike. Find resources in this lesson Memphis 1968: The Sanitation Worker’s Strike. Place the men’s stories in a greater historical context through the reading “A Time of Crisis: The Sanitation Strike” and/or Episode 10 of Eyes on the Prize. What is a community’s obligation towards its members? What are the consequences for individuals and groups who are excluded from community membership? Whose responsibility is it to improve public services? In addition to providing historical context about and testimonies from the Memphis sanitation strike, the activities in this lesson prompt students to think about their own communities, the ways their communities designate who is worthy of respect and dignity, and what can happen when community members don’t feel a sense of obligation towards one another. What is unique about the LA strike? An important distinction between the Memphis Sanitation Workers strike and the 2019 LA Teachers Strike is that in a school, worker conditions are also student learning conditions. The articles included below can start students in understanding the particularities of the 2019 LA Teachers’ Strike. There were many articles were written about this strike; the ones chosen below are just a start. You might begin by asking students to learn more about the context of the LAUSD school system. What do they learn on the LAUSD landing page? What do they learn from the UTLA news release just prior to the strike? What is the student population, teacher population? How are the schools funded related to other large cities? How many students are in LAUSD? What is the per pupil funding? If you do not live in LA, how does it compare to your city or state? Students can explore the following articles using the News Article Analysis strategy, making connections to what they learned about the district. I’m a high-schooler in Los Angeles. I’m standing with my teachers on strike. What have I just learned that I didn't know before? What questions does this article raise? Where can I go to get answers or more information? Where can I go to get more perspectives or different opinions on the issues raised? Follow up by asking students to take the steps they articulate in response to the questions. How much power do individuals have to change their communities? What happens next for Los Angeles? The strike raised a number of questions about what happens next. A number of administrators who empathized with teacher concerns noted solidarity for a combined action in Sacramento and hopes that community support for education would continue after teachers return to their classrooms. How can the momentum for educational change continue after the strike itself? How can students have voice in the discussion on education for California and Los Angeles? This has led to additional grassroots groups such as Students Deserve, and activism by teachers including Rosa Jimenez (described in the same article). What examples of upstander behavior were most meaningful to you? Which provide models for how you might act as an upstander in your life today? Considering the agreement reached, which changes for LAUSD do you consider most important? Given all of the pieces that you read for this lesson, what additional change(s) do you think are important? In pairs or small groups, identify one issue you think would strengthen or build on the changes effected by the strike. For that issue, what would it look like if it were adequately addressed? This could be written or drawn as a visual on flip chart paper.